At the end of the celebrations, timed for St Andrew's Night on 30 November, there is to be a big gig. Wouldn't it be great if at it they played my wee tune? This fella was wandering through Belfast with a carry out, looking for a party he'd been told about. A gang of spides* confronted him. "Geez a look... we'll have these," and the spides confiscated his party fuel. "Ach," said the fella, "what am I going to take to the party now?" "Give him back the drink, he needs it," said the head spide. At this time of year, it doesn't get dark much in the north of Scotland. A couple hours of darkness at most, and a clear night can stay bright enough to read at midnight due to the glow in the sky from the just-dipped sun. In the Northern Isles, this is called the simmer dim, and it compensates to some degree for the long winter nights. I remember cycling unsteadily round Rousay after the pub shut, lights unnecessary, looking across the Wyre Sound to the smooth whalebacks of the Orkney mainland, Kirkwall winking in the distance. I recall visiting a bar in a fishing hotel on the north coast of Sutherland, then retiring to my tent for the night as a couple of punters headed to a nearby loch for a fish. I woke in the morning, went up a hill, and back in the bar that evening saw the fishermen again, who were considering another night of fishing. They hadn't been to bed at all. The simmer dim doesn't affect everyone this way. However one Simmer Dim that would affect everyone is my favourite bottled beer. CAMRA members will tell you there are better cask ales, but they all lose much of their flavour when bottled. For some reason, Simmer Dim doesn't, and tastes just as good out the bottle as on cask. Gather your friends together round a fire and a good malt, and discuss which is the most beautiful glen in Scotland: a debate without resolution will be had, but it is certain that one of the glens under consideration is Glen Feshie. This is one of my favourite glens, and gave a memorable hillwalk, one I expected to be a chore: An Sgarsgoch and Carn Ealar from Ruigh ait-eachan bothy. It was one I did not deserve. The combination of river, tree and cliff on the walk was intoxicatingly beautiful, opening up after a waterfall to high, spacious flatlands, surrounded by the bulk of the Cairngorm and Mounth hills. There is plenty of trout in the river, and the braided gravel beds that are a feature of the river at its bend towards the upper glen must make great spawning grounds for salmon. The trees in the glen are being protected and regenerated by a controversial culling program, kicked off by the shooting of excess deer by helicopter-borne marksmen five years ago. Since then, the deer are shot on sight if seen anywhere in the forestry, in a bid to make them wary of the trees and keep away while they regenerate. It will be interesting to see how successful this project is, as it will impact on deer management across the whole country. Above Glen Feshie lies the extensive tundra moss of A' Mhoine Mhor, but our visit a few weeks ago must have been on the hottest day of the year. We were content to abandon the climb to the high tops, bimbling instead up the glen by the river, paddling, sunbathing, and gaining shade in the forest. 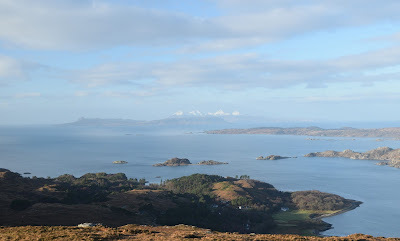 Think about Scottish islands, and the mind immediately rushes west to the Hebrides. Inshore islands are not on the radar. 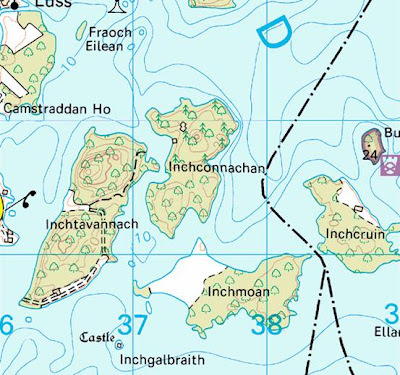 But there are quite a few freshwater islands on Loch Lomond, from the inhabited Inchmurrin (take the ferry there from Arden) to tiny Inchgalbraith. I once heard of an American with the surname Galbraith, who came to Scotland at great expense to see the Auld Country. In high excitement, he hired a boat to take him out to the ruined castle Inchgalbraith. On seeing the tiny island, he exclaimed: "is that it?!" I've only been to a few of the islands, with my current favourite being Inchcailloch. This has historic interest, with an old MacGregor graveyard and vestigial ruins of an ancient nunnery. Of most interest is the steep wooded slopes and views from the summit of Loch Lomond, which are similar to those from the superlative viewpoint of Duncryne, except nearer and more immediate. The latest news story concerns Inchconnachan. This has a colony of wallabies, the last thing you would expect to find somewhere like Loch Lomond. Curiosity is tickled to think of these exotic animals grazing away on a Scottish island. So it was with concern I read recently that the wallabies on Loch Lomond face being culled, as they are not a native species. I hope that if they are got rid of, they find somewhere else for them to live, like the Uist hedgehogs.